President Barack Obama addresses the Seed Savers Exchange on Monday in Decorah, Iowa, as part of a Midwest bus tour. (CNN) -- Social-networking app Foursquare has snagged perhaps its highest profile user: President Barack Obama. The commander in chief has joined the location-based service and will be using it to highlight places he visits and what he does there, the White House announced on its blog Monday evening. 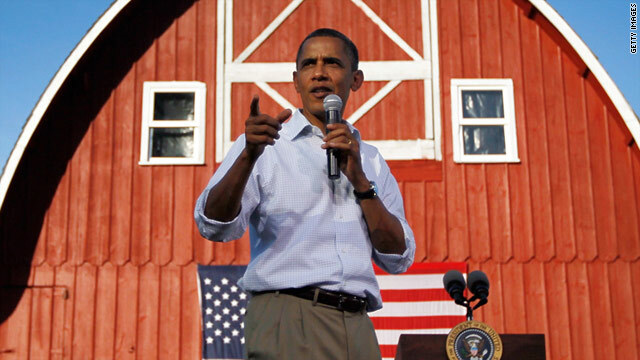 Obama's check-in coincided with a three-day bus tour of Midwestern states. The mobile platform has seen astronomical growth as users turn to it to find out where their friends are hanging out and what they recommend you do when you get there. On Monday, the White House posted its first tip -- from a town hall meeting at a riverside Minnesota park in Cannon Falls. "President Obama discussed ways to grow the economy and strengthen the middle class with a crowd of 500 people at Hannah's Bend Park on the first stop of his economic bus tour across the Midwest," the White House said. Foursquare is just the latest foray into social media for the president. He's already on Facebook, Twitter and LinkedIn. Searching for "Barack Obama" on the app will pull up a man in Salt Lake City and one in London. One appeal of Foursquare is to check into a site so often that you can oust someone else to become the "mayor" there. For Obama, that raises a question though: How appealing is "mayor" when you're already president?